I can't say I expected to be focusing on a book about writing for this blog post about crafting. But after finishing bird by bird by Anne Lamott, I can't think of anything more appropriate. It turns out there are many similarities between the writing process and the crafting process. Much of the book's content relates to any creative process. Let me explain. The title, bird by bird, refers to the idea of taking things one step at a time. The enormity of our vision and goals, even for a single, seemingly small, project can stifle our ability to simply get started. But start we must. A fine scarf is comprised of many small stitches. This is equally true on a bigger scale: a medium or long-term project. Your best photograph of the year comes from days or, more likely, months of doing shoots that aren't quite right - until one is. For me, a batch of t-shirts begins with just one, but ends in hundreds of finished pieces. The first one is always the hardest. The examples are endless: creating a collection of mugs for a holiday show, crafting a scrapbook to welcome a newborn child (congrats Jessica! ), or setting out to paint the world, all of it, as you see it. The book is bulging with beautiful ideas and funny passages. But just one more I'll mention. The author talks a lot about creating crappy first drafts. Even the greatest writers do this. And I'd bet my Michael Jordan autographed golf card that great visual artists do too. Embracing the mistakes could be the key to future successes. If we stopped trying to walk after taking our very first steps the entire world would still be on all fours. Can you imagine? We would be going to school, to work, to the opera, dancing, hiking - on all fours. No one would be dunking, that's for sure. But, and it is amazing, people do dunk in our world! Along with lots of other truly awesome things. So get crafting, make mistakes, have fun, and take life stich by stitch. Yao Ming takes it step-by-step. 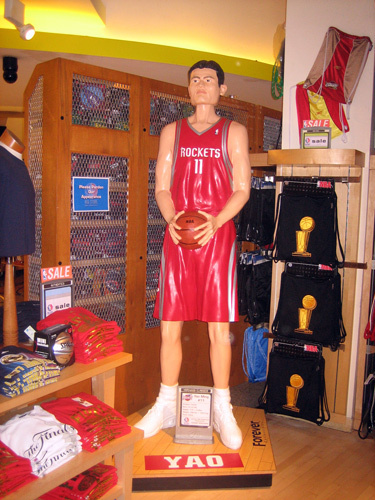 Even Yao used to be a small child, think about that! Awesome parallel, even for those non-crafters out there! It's good to be reminded to take projects, assignments, dreams, and life in general one step at a time. Thanks for the congrats Evan :) I read 'Bird by Bird' in grad school and it was soooo inspirational for me in my thesis work which was intense writing combined with image making. Another book that I read at that time which was also super inspiring is called, "Writing down the Bones" by Natalie Goldberg, which is a book more directly about creative and autobiographical writing, but like the Anne Lamont book, much of it can relate to all forms of creativity. Thank you for writing this post!